Finally the new Youngman Teleguard has arrived. Based on the well known Sherpascopic and sherpamatic podium steps design, Youngmans have taken this product made it more robust and added further safety features. We are happy to now offer this product in our podium steps range. Small Teleguard- Gives a Platform height of 1.1m to 1.6m (working height of up to 3.6m). Large Teleguard- Gives a Platform height of 1.9m- 2.45m (working height of up to 4.45m). One piece construction- no component loss on site. Large range of working heights from the same unit. Handy deep tool tray to hold your tools and fixings while you work. 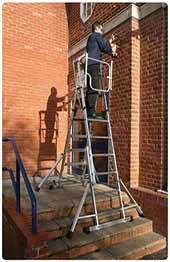 Stepladders, they’re inefficient, dangerous, and in the end their costs exceed what you thought you initially saved. Stepladders are proving to be an exponentially growing hazard on construction sites. In this new age of safer work environments, podium steps are becoming the new industry standard. Podium steps have proven themselves time and time again to produce better results than stepladders across the board on benefits. Podium steps on average outperform the standards of current construction site safety regulations. The working at height regulations (WAHR) endorses using products that reduce stress on the body while working. Unlike stepladders that cause workers to crouch, twist and move in unnatural fields of motion, podium steps provide the advantage of working in a field workers feel comfortable, and less likely to injure themselves. Just one year before WAHR was put into effect, 69 people were estimated to die per year for falls under one meter. What is the cost when a worker falls and gets injured? The cost doesn’t just stop there; think about what it does to production since you’re now one man short. In the short and long run podium steps are saving you money by reducing preventable work related accidents. You’ll be surprised how fast you can wheel podium steps around a working site. It’ll take you less than 15 seconds to set them up anywhere. Their anti slip platforms, and guardrails make them safe enough to carry heavy tools so workers can have everything they need at hand to complete a job in less time. If these 3 reasons weren’t enough proof to get you interested in investing in podium steps what will? Remember, every podium step you use on a construction site is cutting your man hours and boosting your productivity. Advice: Stop wasting time and money today! Find out how podium steps are setting the standards of how construction should be done.